Do you have old videotapes or movie reels that you cannot watch anymore? 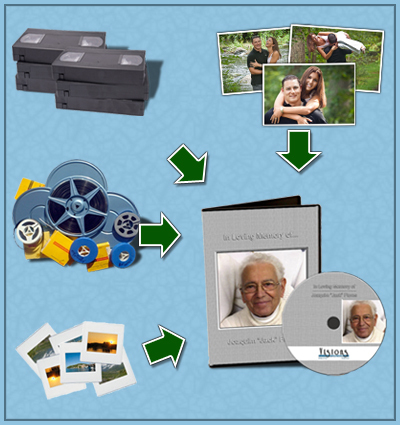 Would you like to share your printed photos and old 35mm slides with your friends and family? Are there family members from the past who's memories you would like to revisit? If you answered yes to any of these questions, then Visions Forever has the solution. We will recapture your memories to a modern format so they can be shared with your friends and family and enjoyed for generations to come. With a professional staff and award winning customer service, Visions Forever will walk you through the steps of preparing your memories for conversion. It's that easy to reclaim your memories...Forever!!! Amount of Time included - Our portrait photography includes a designated amount of photography time for taking photos within at one of two local parks. Portraits shot at other locations is available, inquire for pricing. Outdoor photos - We photograph at one of two local parks. The beautiful lanscapes and natural outdoor setting make for the perfect backdrop for any portraits. Destination portrait photography is availabl, inquire for pricing. Up to 4 outfit changes - Bring up to four wardrobe changes for indoor and outdoor posing. Our changing room is equipped with hooks to hang clothes to avoid wrinkling and a full length mirror. Images online for six months - Your images will be displayed on our website so they can be shared with all of your friends and family. Also order any additional prints right through our website saving you a trip back to our studio. CD proof set of web quality images - Receive web quality copies of your images on a CD for viewing on your computer and sharing online. Image(s) to be digitally enhanced and re-touched - The image(s) that you choose for prints will be digitally enhanced and re-touched. Color correcting, exposure correcting, blemish removal, whitening of teeth, and other basic enhancements are included (advanced enhancement such as removal of braces are available for an additional fee). All printed images are digitally enhanced. Additional retouched photos not included in portrait packages are available for $25 per image. 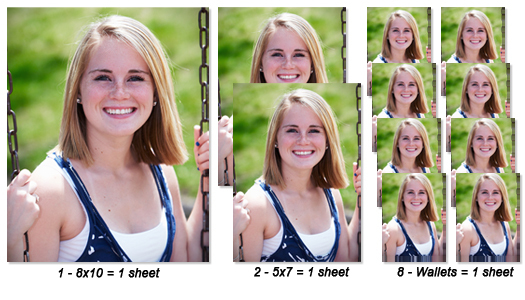 Choose any combination of prints - We allow you to choose what image sizes you want. Whether you need more 5x7's for the grandparents, 8x10's for the walls, or wallets for all of your friends, we allow you to customize your print package to fit your family's needs.